When Rogers signed a landmark $5.2 billion, 12-year deal for NHL rights in Canada, it also meant changes for CBC’s Hockey Night in Canada. The first major change was the replacement longtime host Ron MacLean with George Stroumboulopoulos, a move seen to attract younger audiences to the broadcast. According to the latest poll by Angus Reid to 1504 Canadian adults, the move to replace Ron MacLean appears to be an unpopular one. 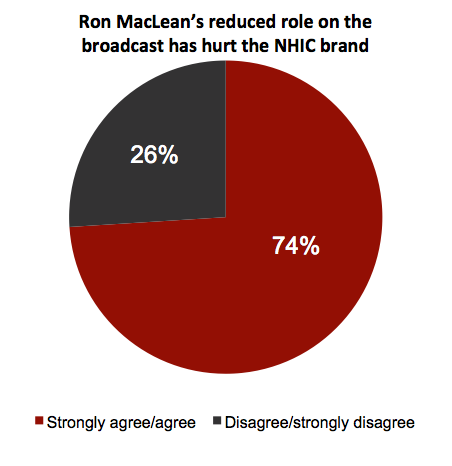 Poll data shows 74% of respondents agreed Ron MacLean’s reduced role this year has hurt Hockey Night in Canada’s brand, while 48% said they saw him “too little” on the broadcast. As for well-established CBC host George Stroumboulopoulos, 60% of pollsters said they do not see him as a credible replacement for Ron MacLean as the host of HNIC, with 41% noting they’re seeing him “too much”, while half say his airtime is “just right”. Last Saturday, Don Cherry complained on air to Ron MacLean saying “Why are we tight? Why are we tight?” when told by the latter they were short on time, marking the first time Cherry vented on air about their new limit of five minutes on air, versus six minutes previously with the CBC. President of Sportsnet, Scott Moore, told the Globe and Mail Cherry’s dispute was just “a tempest in a teapot”, saying the latter was frustrated because he “had a lot to get in” on Coach’s Corner. Unnamed sources close to HNIC told the Globe this was seen as a test of wills between Cherry and his new Rogers bosses. However, when asked about balanced coverage of all NHL Canadian teams versus broadcasts too focused on teams in Ontario and Quebec, respondents favoured Rogers Sportsnet at 75%, compared to just 65% for the CBC when it came to balanced coverage. Rogers spent $4.5 million on its new Hockey Central Studio in Toronto, which has 11,000 square feet, nine separate sets and 52 monitors, and took six months to build. The company also now powers NHL GameCenter LIVE, which is being marketed as a way for people to stream games on their smartphones and tablets. What do you think about Strombo replacing MacLean? Yay or nay? Or will you need more time to decide?